Young people are being forced to live in caravans due to a lack of affordable housing in their areas. As places such as Cawsand Bay and the Rame Peninsula become known as major attractions to tourists and visitors, it creates a high demand for holiday homes, which send property prices spiralling. The results can be so bad some Cornish young people have had to think outside the box when it comes to finding a place to live. 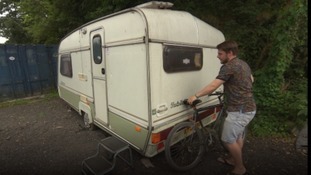 21-year-old Lewis now lives in a caravan. wage rise needed by the average young person to get a mortgage. average house price in coastal towns like Cawsand and Kingsand. Despite a project launched to convert a disused pub into more affordable flats, many young people in the area are still missing out. Some say their own options are to compromise their living standards, or leave Cawsands for good.